On Wednesday, February 11, 2009, the Christian Action Network premiered Homegrown Jihad: Terrorist Camps Around the U.S. at Washington, D.C.'s Landmark Theater. The crowd of 160-175 people left the theater with their jaws dropped, only moving their mouths to thank the members of CAN for their hard work. The robust Q&A session brought only positive remarks and constructive questions about the networks of an organization known as Jamaat ul-Fuqra, a group led by a Pakistan-based cleric named Sheikh Mubarak Gilani with at least 35 radical Islamic compounds here in the United States under the name "Muslims of America." A key feature of the documentary, which is available at ChristianAction.org, is the "Soldiers of Allah" videotape, on which Gilani is seen instructing his followers on how to hijack cars, set off explosives, murder guards, and use various other terrorism tactics as part of what he admits is "one of the most advanced courses in Islamic military warfare." This is followed by an open invitation for interested Muslims to contact any of his Muslims of America compounds in the United States to receive such training. He even warns the viewers of the tape to not allow it to fall into non-Muslim hands and not to make illegal copies. The compounds are in isolated areas all over the country from Washington down to California, to Tennessee and Michigan, and New York all the way down to Georgia. While the Christian Action Network manages to identify some of these camps and is even seen visiting some of them in the film, Sheikh Gilani has mentioned having sites in many states that have not been located by CAN. These are not simply isolationist Muslims seeking to get away from the sinful ways of American society. The camps have websites that are devoted to Sheikh Gilani, hailing him as a miracle-worker that is a descendant of the Prophet Mohammed. 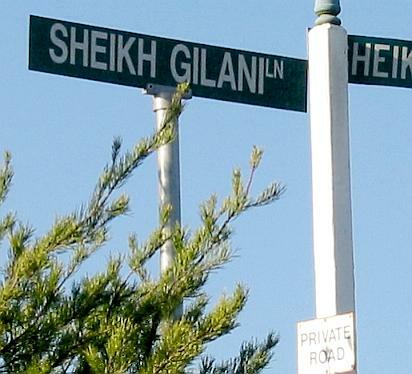 One site in Red House, Virginia, even has a street named "Sheikh Gilani Lane." Gilani, while espousing to be a man opposed to terrorism and extremism, has made such statements as "Jews are examples of human Satans" and "We are fighting to destroy the enemy. We are dealing with evil at its roots and its roots are in America."